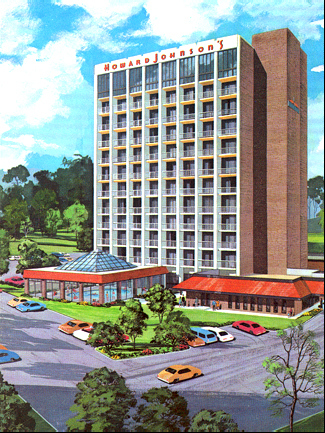 Slated for a summer of 1969 grand opening, this showpiece of a Howard Johnson's location did not come online until the fall of 1972 or early 1973. 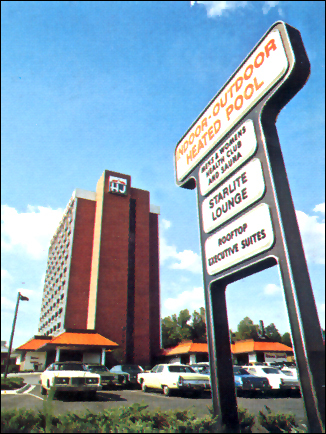 Featuring 172 guest rooms, the twelve-story Motor Lodge was a model HoJo's with its stand-out features and terrific location. 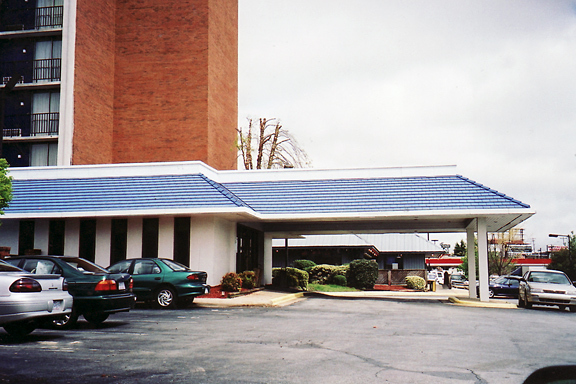 Howard Johnson's COLISEUM Motor Lodge is a model of all a convention and banquet facility should be. 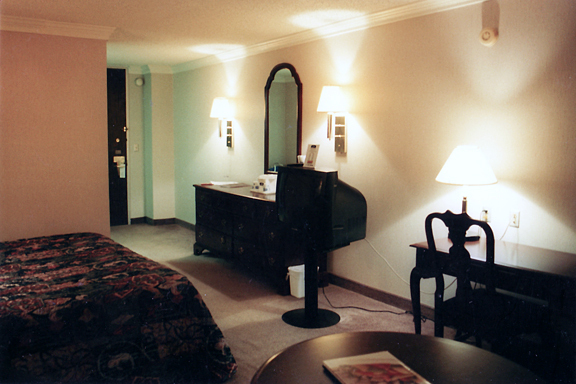 Four large, handsomely decorated rooms can be easily adapted or combined to serve any type of function. Each features superb acoustics and is well appointed--lecterns, microphones, amplifiers, mobile blackboards, audio-visual equipment, and special services are available. 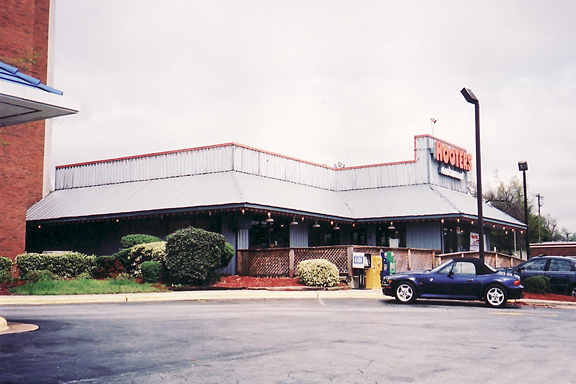 Whatever you need, just ask for it. 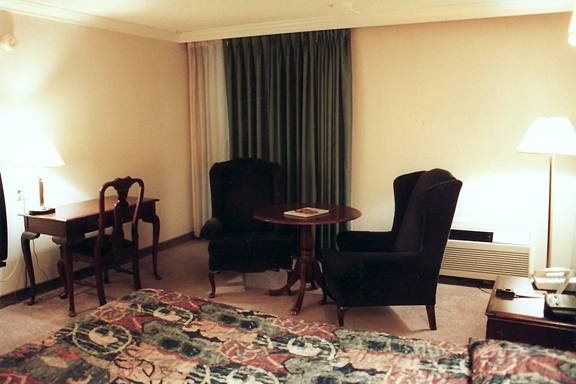 In addition, 16 penthouse executive suites offer every comfort for that important small conference or VIP party. 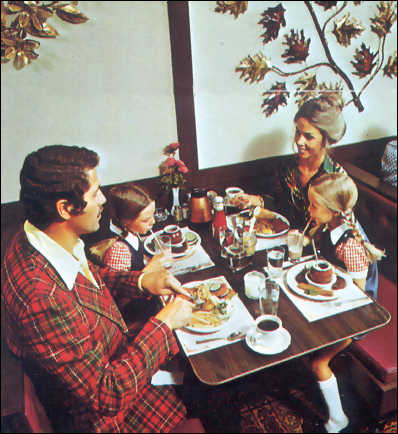 Complete catering is offered for any occasion... and you can count on our courteous, well-trained staff to make any function hum smoothly. 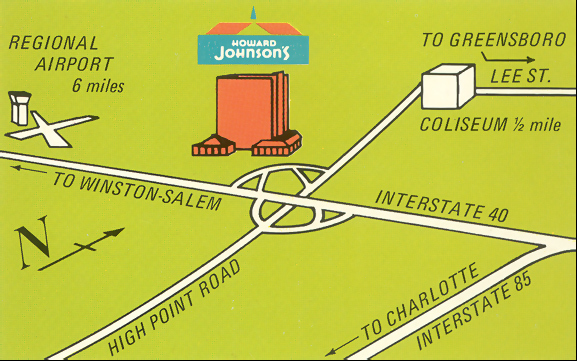 To relax, to work, to enjoy yourself... come to Howard Johnson's COLISEUM Motor Lodge for a perfect time every time. 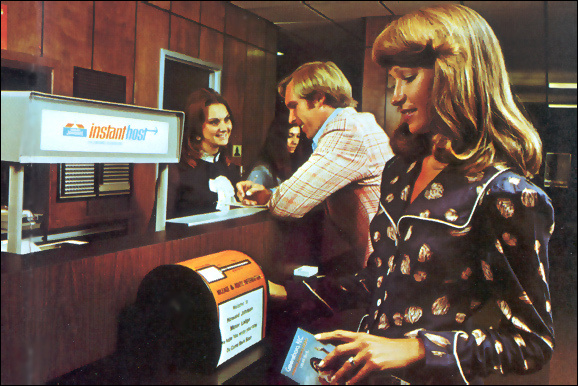 Convenience abounds inside Howard Johnson's COLISEUM Motor Lodge, too. 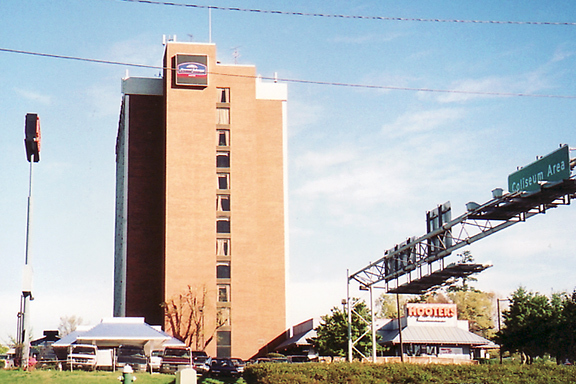 It is a resort in the city. 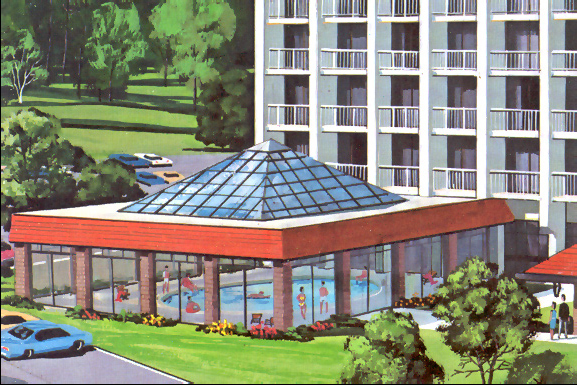 Complete with prestigious meeting and banquet facilities, luxurious rooms and suites, a fine restaurant and lounge, ALL-SEASON doomed swimming pool, fully-equiped health club and sauna baths, express elevators, fast, efficient room service, ample free parking. 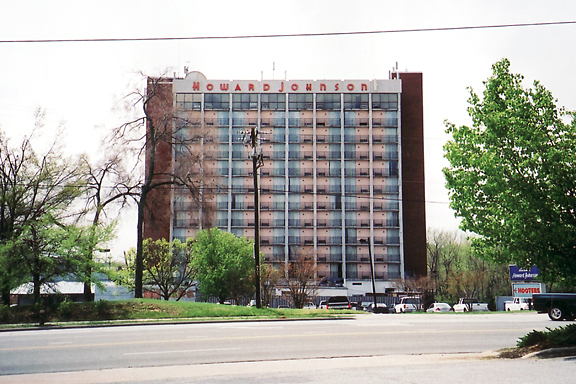 The lush new look plus ideal location -- combined with spacious facilities for any size meeting -- make business a pleasure at Howard Johnson's COLISEUM! 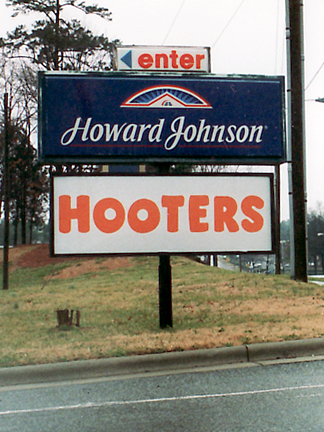 The Greensboro-Coliseum Howard Johnson's was the LAST Motor Lodge to display the authentic original "HOWARD JOHNSON" lettering (it's apostrophe 's' was removed after 1986). 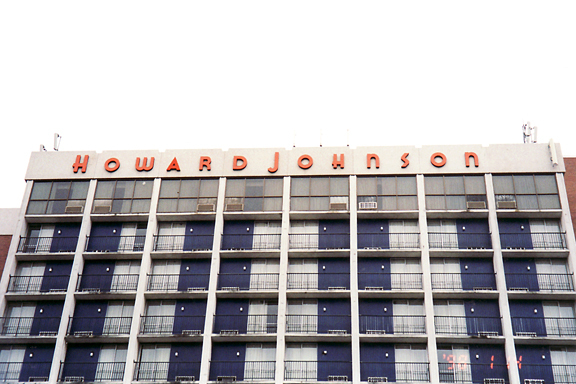 Moreover the giant letters spelled out Howard Johnson over twelve-stories above the ground for everyone to see!! 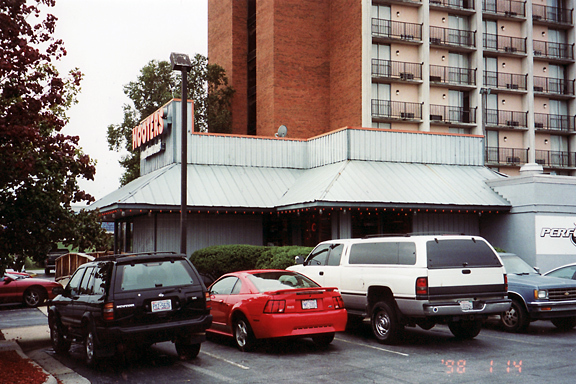 Bob Venditti wrote "Up On The Roof... very busy interchange with a bumper crop of eateries and hotels," and "the big draw for the HJ is the Hooters who's patrons took up all of the front hotel parking." 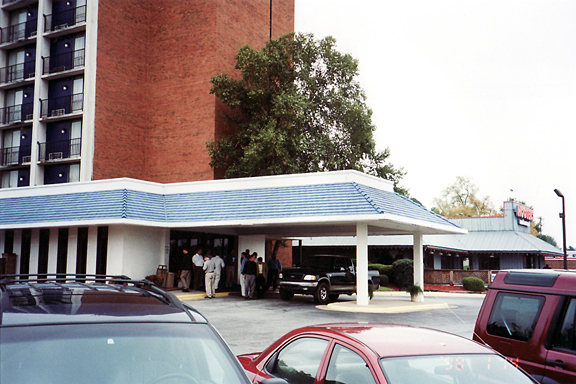 Additionally Bob pointed out that the high-rise Motor Lodge featured a different color on each side. 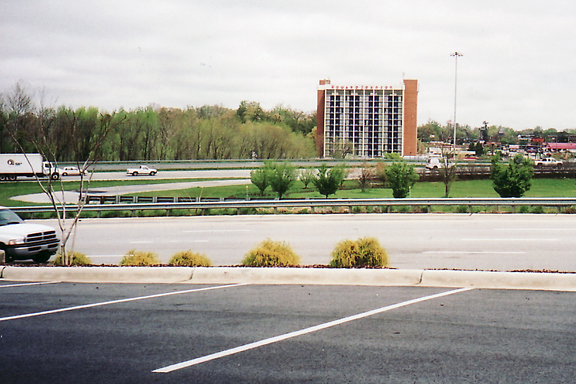 By Mr. Venditti's early 2005 visit, not much original had survived in the guest rooms. 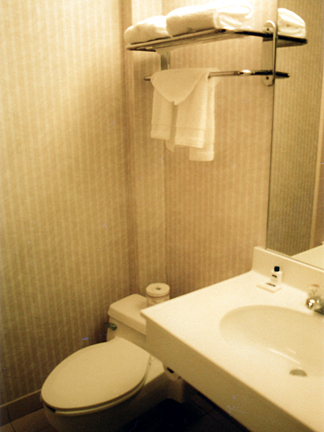 However the once silent-flush toilet as well as a partially hidden Pamper Panel remained in his room! 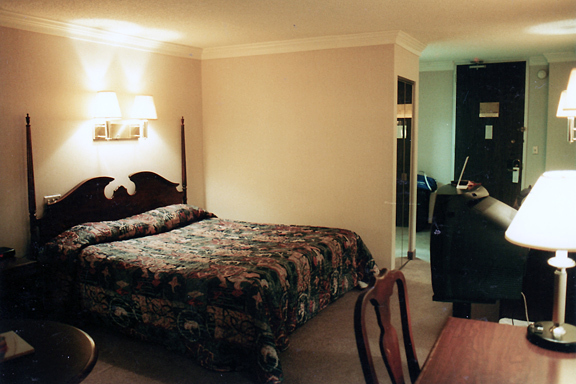 Bob observed that while his "room and bath were clean and in good repair," it "was a bit disappointing." 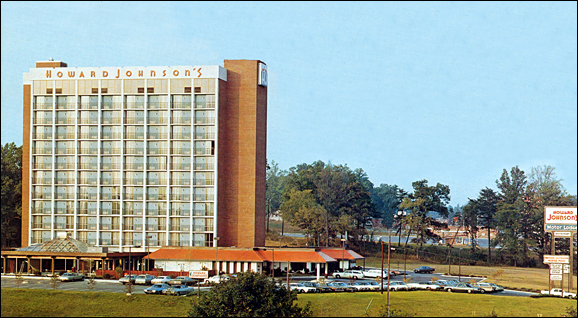 Its furnishings had begun to show their age. 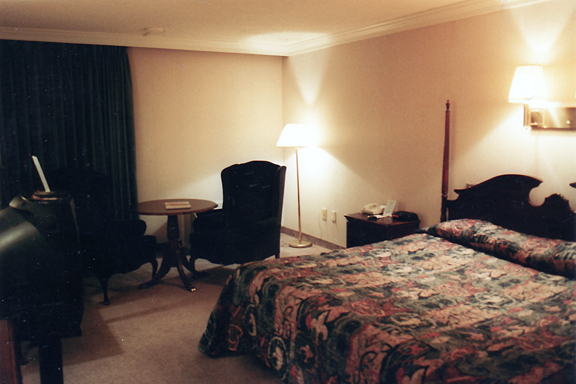 He noted that the room's bed was "old and decidedly crescent shaped." 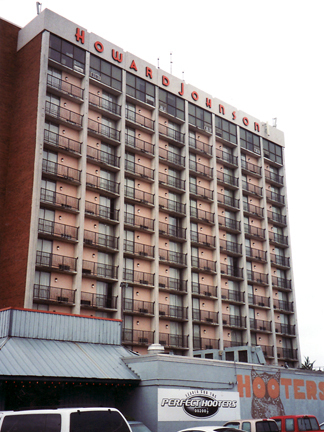 Overall he said, "Certainly not a bad stay by any means, and where else are you gonna find that original-type rooftop lettering! 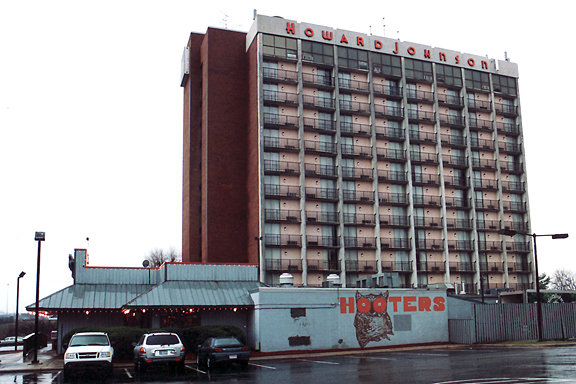 When you can look up and still see that at this late date, it's what allows a Hojomaniac to forgive just about anything."